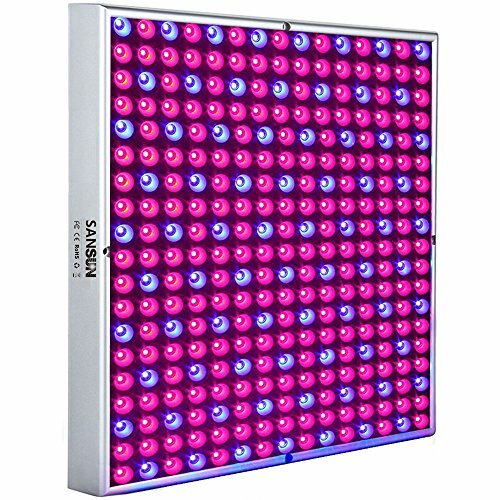 This LED Light uses combination of Red, Blue lights can make your plants flourish more and thickset. The Blue light (465 nanometers) ensures peak chlorophyll absorption in the plants, ensuring vegetative growth. The Red light (650 nanometers) also ensures large absorption of the nutrients. you can give full care to your plants. Much brighter and More effective! Excellent for your plants! Widely used in greenhouses, plant factory, greenhouse farming, flower farming, indoor gardens, water soluble breeding, pipeline cultivation, farm, potted plants, spray the plant, tissue culture and so on. especially suitable when the plant need extra boost of light. or there is little sun, or in raining, snowing , dark, indoor environment, etc. ✔ ENERGY SAVING WITH FLEXIBLE COVERAGE: Replace typical 50W hps or HID grow lights. Good for 2' X 2' growing area. ✔ EASILY ASSEMBLE: Plug in to turn on and unplug to turn off, controlled simply as you want, also compatible with an auto timer. ✔ APPLICATION: This plant growing light can be used for both hydroponics and plants in soil, such as tomatoes, potatoes, pepper, lettuce, aquarium plants, etc. ✔ SUITABLE FOR ALL INDOOR GROWING ENVIRONMENT: grow tent, grow room, etc. If you have any questions about this product by SANSUN, contact us by completing and submitting the form below. If you are looking for a specif part number, please include it with your message.